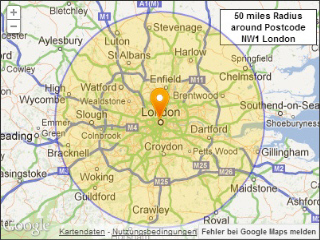 Postcodes within a Radius of 50 miles around Postcode NW1 London. 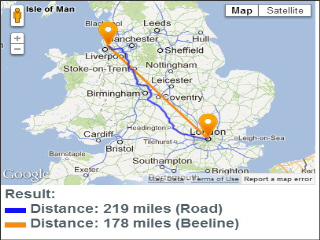 "...It has been a great help for us to use your 'postcodes within radius' scripts and implementing them in our ASP.NET web application. Thank you for providing you free radius scripts with the google maps visual aid..."
"...We have been looking for an easy implementation of a postcode radius calculation in PHP. Thank you for this incredibly smart script, it easily saved us 2 days of research and programming. What we love even most is the visual display of all hits in the radius map..."
"...We are using the free MS Access desktop application to determine postcodes within a given radius. Thanks for leaving the source code open. And we want to let you know that it has been the easiest solution for us after hours of searching. Thank you for providing such a great support..."